Do you know anyone clamouring to eat genetically modified (GM) food? One of the many reasons I voted Remain in the 2016 referendum was because the European Union (EU) largely protects its citizens against this unproven technology. Look, I am not saying the European Union (EU) is perfect. It needs reform. Obvs. But, in some areas, it has acted on my behalf. The EU has also largely prevented the commercial growing of GM crops, only giving permission for one GM crop to be grown. In addition, European consumers can make informed choices about whether or not to eat GM thanks to the EU insisting that GM ingredients are labelled (unlike in North America, where its citizens are now campaigning for GM labelling). (Sadly, the EU does not label dairy and meat from animals fed on GM, but that is another story, and one that anti-GM campaigners are working on.). GM is not popular in Europe. Over half of EU countries officially ban GM. And British citizens have resoundingly rejected it. UK governments – Labour and Conservative – are, however, pro-GM. So far, the EU has prevented our green and pleasant land being turned into one giant biotech experiment. The question is: without the EU, how will our GM-free future fare? The pack of cards is in the air. The terms of Brexit have yet to be set in agriculture, as in all other areas. Food and farming charities and organisations are wholeheartedly seizing this opportunity to lobby for sustainable farming. However, the seed and chemical corporates are also seizing this opportunity, only in their case, to lobby for their profit-driven biotech future. And these multinationals have huge financial resources and well-oiled lobbying machines at their disposal. In addition, a recent merger of Monsanto and Bayer increases their voracious drive for new markets. To whom will our government listen, the sustainable food and farming groups, or the multinational corporations? What will the UK government do? The UK government has signalled it will not be following the EU’s Common Agricultural Policy (CAP). That is good – it needs reform. However, one of CAP’s merits is that it is strongly against GM. In a parliamentary written answer in October 2016, agricultural minister George Eustice said that “as part of preparations for the EU exit, the Government is considering possible future arrangements for the regulation of genetically modified organisms…Government “policy and regulation in this area” should be “science-based and proportionate”. Possible future arrangements for regulation? From a government in favour of deregulation? Uh oh. Forgive my cynicism, but post-Brexit, I fear we are girding our loins for another fight to protect our fields and food from GM. If the UK voted Brexit to strengthen sovereignty, then GM means a potential loss of food sovereignty. Why? When a biotech seed company genetically modifies a seed, it gives the company the legal right to patent it. Whoever owns the seed (via a patent), controls our food supply. Yet seeds know no boundaries and naturally cross-pollinate. When a GM seed lands unlicensed on a farmer’s field, the farmer can be sued. Half of all seeds worldwide are now owned by a handful of multinational chemical companies, and their seeds are becoming increasingly expensive. According to Charles Benbrook, chief scientist at the US Organic Center: “The $70 per bag price set for [GM] RR2 soybeans in 2010 is twice the cost of conventional seed and reflects a 143% increase in the price of GM seed since 2001”. GM ties farmers into expensive arrangements because they have to buy the proprietary pesticide that goes with the GM seed engineered to not die when sprayed with these proprietary pesticides. GM alters the genetic make-up of seeds – a GM seed is not the same as its non-GM counterpart. We do not know if GM food is safe or healthy to eat. There are rising incidences of allergies in the US where, due to the lack of labelling, consumers have unwittingly consumed GM for decades. There is a growing body of studies which suggests GM food can be harmful. Organic standards ban genetically modified ingredients from every stage of production – one of the many reasons I chose organic food. So, fellow real food lovers, I beg you, get informed about the risks of GM. I admit it. I was flattered. Pinterest wants to feature one of my Pinterest boards during its registration process for new UK users. Right, what is Pinterest? It is a new social media network – based on sharing images – that has grown phenomenally in its three-year existence. Thanks to Mike Farrow for turning me on to Pinterest – companies were finding Pinterest was driving more sales than Facebook. Explaining this phenomenon, Steve Longoria quotes stats that 80% of Pinterest users are women, saying, “women love to shop” (ouch, goes feminist-self). But there is more gender-balance in UK, according to David Moth at Eco-Consultancy. Do see Eco-Consultancy’s analysis of how huge (and small) brands use social media. Most instructive. Yes, I can see how retail is suited to images. Selfridges is on Pinterest, so is Ocado, Yeo Valley, Clipper Tea, campaigners such as the Woodland Trust, and (I like this one) National Rail Enquiries. I set up action brand, Fish4Ever, on Pinterest. 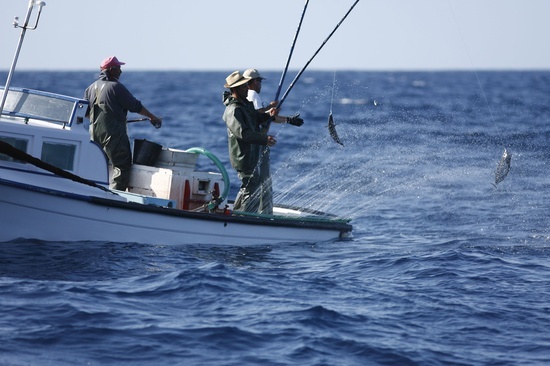 Its pictures tell the stories of sustainable fishing and its the fight to support small fishers, so suited to image-led Pinterest. Then, when browsing Fish4Ever products on Ocado, I noticed a Pinterest button on each of its product pages. Ooooh, that made it easy to upload the product images to a new Board I titled: Fish4Ever on Ocado. Then, when you click on the Ocado Fish4Ever product image at Pinterest, the link takes you back to the UK online supermarket so you can buy the product. Neat. I also set up my own Pinterest account. It is a way of mapping out interests online – pleasingly visual. I have just started a Board to gather my recent blogging/journalism. And I also made a Board for Books. 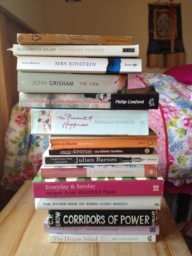 (Above a pic of pile: books I am reading, want to read or have read but can’t bear to be parted from). Pinterest founder Ben Silbermann indicates its success may also be be down to this marketing approach: having local events to engage local bloggers. Verrrry interesting! (see my comment below in ‘Comments’). According to marketing blog, Pinster, Pinterest has been very successful at generating traffic for US bloggers and invites UK bloggers to share reports of any traffic increases as a result of this current marketing drive. 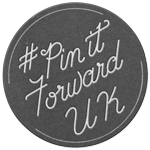 Getting ten UK bloggers a day to Pin It Forward for 30 days sounds a Herculean task especially if they were as recalcitrant as I was (haven’t I got enough to do?). Laura Scott is a fellow food blogger with a beautiful and practical blog, How to Cook Good Food, and do see Laura’s fascinating and share-able How to Cook Pinterest Boards. Inspiring, too. I am gonna get pinning. A coincidence. I was planning this post on Lady Eve for Organic September when environmental journalist and historian, Erin Gill, passed through Bristol. “Eve Balfour,” said Erin Gill, emphasising the word, Eve, as we sat in the Better Food Company cafe today. Eve is what her friends and family called her. The title was expedient, thought Erin. Certainly useful when campaigning for counter-culture sustainable farming. (Eve’s title was inherited from her childless uncle, Arthur, the first Earl of Balfour, responsible for the Balfour declaration). But I feel frustrated! Why are these perfectly sane, common sense ideas deemed unorthodox in the first place? As Shell prepares to drill in the melting Arctic, I despair about this terrible struggle for long-term care to prevail over short-term profits. It’s not through want of vision. 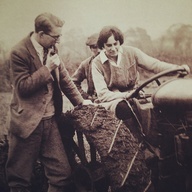 Eve Balfour wrote The Living Soil, published in 1943 – a synthesis of emerging thoughts linking sustainable farming to health – and co-founded the Soil Association in 1946 to spread the word. 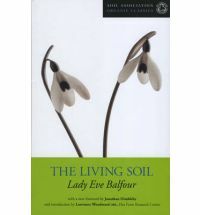 Eve Balfour’s book, The Living Soil (reprinted 2006). The book helped kickstart the organic movement – a rising tide of hearts and minds from both the left and right of politics which questioned quick-fix chemicals, animal factories and the monocultures of factory farming. Their prophetic vision foretold a depleted soil with negative knock-on effects. The organic pioneers called for biological and ecological sciences to underpin farming, not the increasingly-dominant chemistry one (which sadly gained more sway from developing munitions in two world wars). To me, these organic pioneers were inspiring, standing up for nature against the increasing industrialisation of the west. Eve Balfour speaks my language. “…They are beginning to understand, for example, that health is something more than than just not being ill, and that the right approach to health consists not merely in the prevention of disease but in the promotion of vitality in both organism and environment, for the one cannot be studied apart from the other. Soil health equals human health, as this Huffington Post film review of the Symphony of the Soil (we helped organise its London premiere), shows. However, despite its benefits, organic farming receives little UK government support compared to other countries in Europe. What a terrible shame – organic food should be available and affordable for all, for the sake of soil, water conservation, animal welfare, bees and other wildlife, wild flowers, and our health. Post Script A recent review from Stanford University indicated organic food may have less pesticides but is not more nutritious than non-organic food. The review (and the ensuing media frenzy) is rebutted by US scientist, Dr Charles Benbrook. This article on the NHS website also looks at the Standford review’s methodology. And, a great response from food writer, Michael Pollan. I like this rant from Riverford Farm about organic food getting knocked just when it’s never been better.